This is a list of some of the best review material for the Civil exam that I have found. Most of this I have used personally and will reference occasionally throughout other articles. Please note that many of these links are straight links to Amazon or elsewhere and I receive a commission if you purchase through them. The CERM. Everyone I have spoken to used, is using, or plans to use this on the PE test. There is a reason for that, Michael Lindeburg and the team at PPI have been at this game since 1975, they know what to include. Be wary of studying every topic, not everything (or even a fraction of everything) will be applicable to you. Other than that, it is a great reference and you should plan to at least read your depth section from cover to cover. It is excellently tabbed and marked and great for the actual test. Personally, it gave me the answer to several depth and breadth questions and the glossary in the back was invaluable. Longer CERM review here. Civil Engineering All-In-One (AIO, Goswami). I see this as the only real competitor to the CERM. It is less expensive, smaller, and more straight to the point, which is beneficial for the exam. The AIO also covers all of the breadth and also every depth option, which is great but be wary of over studying certain sections. I enjoyed having this book in addition to the CERM but if you really can only get one book, get the CERM as it does cover more topics. During the exam I did the majority of my quick look-ups in the AIO. I prefer the layout and presentation of topics in the AIO. I recommend both books if you can afford it (and here is a hint, you CAN). NCEES Practice Exams. These are past versions of ACTUAL exams and are EXCELLENT. I purchased the Structural, Construction, and Geotechnical versions and they have been a huge insight into what types of problems will be on both the breadth and depth of the test. I was able to memorize these before the test, it was hugely beneficial. Practice Problems for the Civil Engineering PE Exam: A Companion to the Civil Engineering Reference Manual. These practice problems go hand-in-hand with the CERM. I bought them, and am glad that I did. Bear in mind that these problems are DIFFICULT, much more so than the actual test. If you want to go into the exam truly confident then you could solve and understand every question in this. I plan to solve all the problems for my depth option at least. Six Minute Solutions. I purchased these for the Geotechnical Depth and they were a huge help. They provide both breadth and depth questions and I recommend going through all of them for you depth module. They are just slightly harder than what appear on the actual test and are a great way to learn concepts and build up speed. I learned several concepts from these questions as well. Texas Instruments 30X IIS. This is the calculator I will be taking to the test. I used it all through my undergrad and continue to use it at work. It is cheap, solar powered, can enter fairly long equations, follows PEMDAS (order of operations) fairly well, and has two display lines. Texas Instruments 36X Pro. This is the calculator I would purchase TODAY if I were getting a new one. It expands upon all the offerings of the 30x IIS and also has support for calculus, has a display screen more similar to graphing calculators (equation on left, answer on right) and has a huge number of features. Casio FX-115 ES. If you have something against Texas Instruments I recommend taking this calculator to the test. Several of my friends at school used it and it stacks up well against the TI calculators. It is solar powered, follows PEMDAS, does calculus, has two display lines, and lots of memory storage. AISC Steel Manual. I purchased this back when I was in school for a much cheaper price than on the AISC website. This is mandatory for the structural depth portion as it has a ton of quick-lookup tables for steel member sizes and other characteristics (Z tables etc). NDS Wood Manual. I am not sure if this is as mandatory as the Steel Manual, the tests I have seen are using many more steel members than wood members and the important equations in this are covered in the AIO. However, I already own it and it will likely come in useful for the test. ASCE. Has a lot of building code requirements and is especially helpful for the seismic design requirements in Chapters 12 and 13. If you are in CA and are taking the seismic exam, this is a MUST! My work had a copy so ask around. If anyone has any advice or wisdom on code manuals for other depth options, or when I get the time to research some, I will place them here. EngineerBoards.com. A really helpful forum for all engineering disciplines. EngineeringVideos.net. Is a collection of free video guides on Civil Engineering topics for the PE exam. It is a great resource for anyone preparing for the exam, or that wants to learn more about engineering, in a video format. PE Exam Review. PE Exam Review is a professional engineers exam study guide resource. Learn tips and tricks on what you need to know for the Professional Engineers Exam and start on the path to getting your Professional Engineers License. Civil PE Exam. 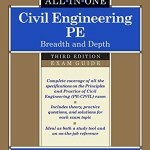 Civil PE Exam offers an up-to-date listing of resources available to you for the PE Exam. Directories for Books, Videos, Classes, Calculators, and websites are maintained and you will probably find new good resources for the test.